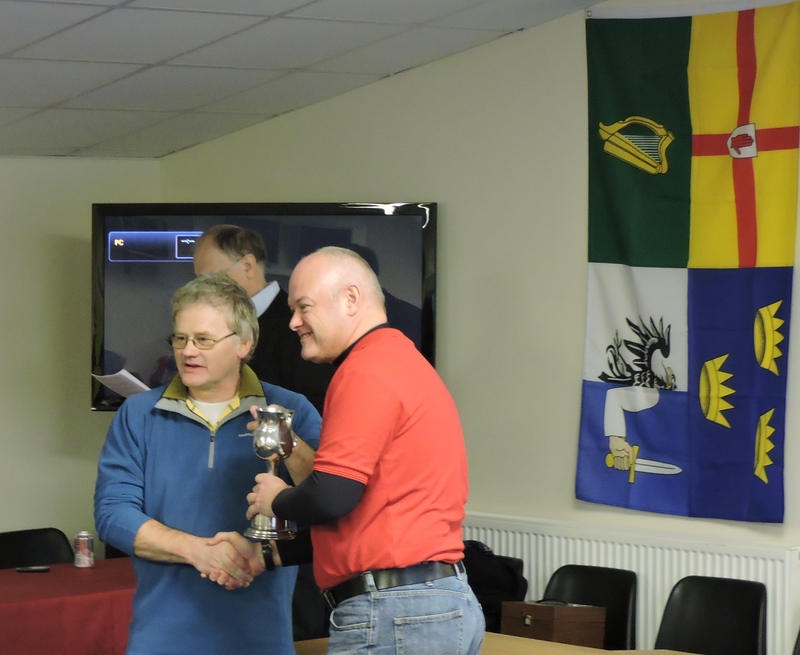 Before the memories fade of our members heroic exploits last weekend, here is a slideshow of photographs from the fabulous Four Nations at Fentons…..
“Thanks Adrian” or “there you go Adrian”. One or the other. 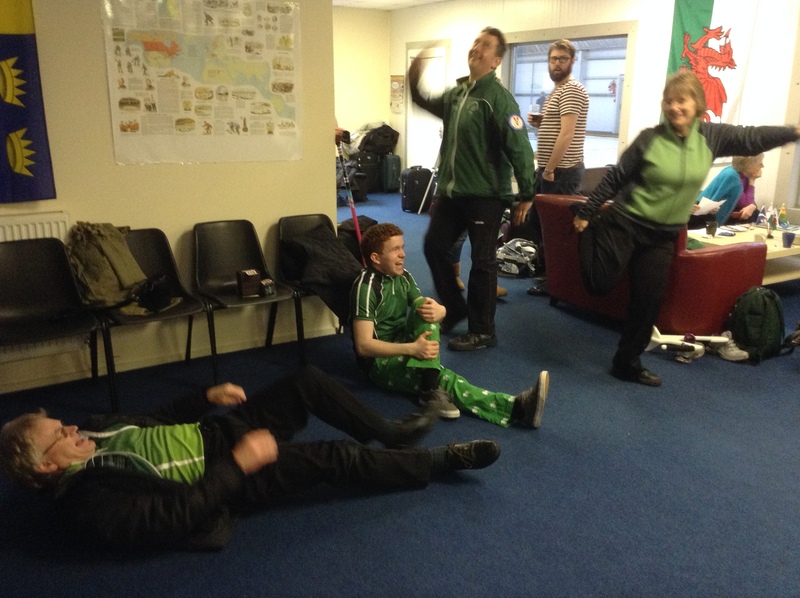 The trousers – and Gillian! Arran and Margarita in action. 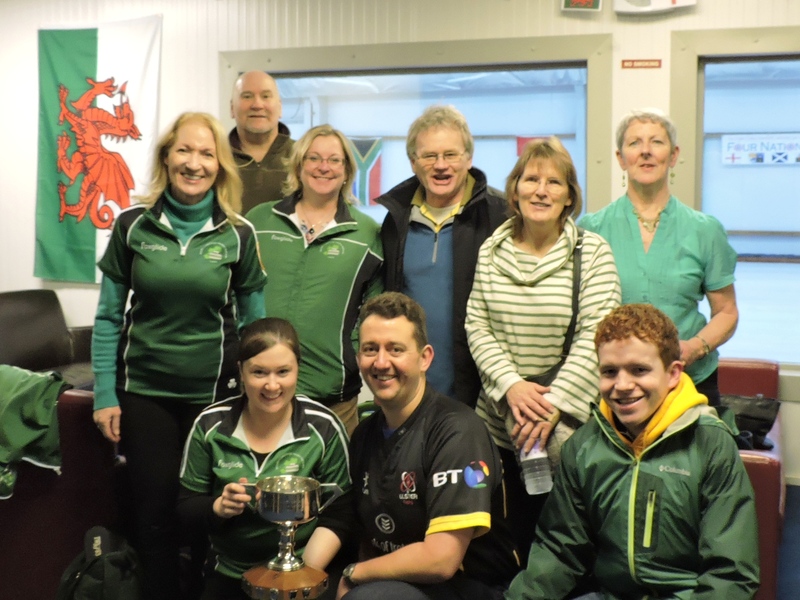 “I would like to take this opportunity to thank everyone for making the effort to travel down to Fentons Ice Rink in Kent to represent Ireland at the annual Four Nations competition. Everyone played their hearts out to beat Scotland and England, only finding Wales too good for us – this year! PJ and Carolyn went into battle against the Anglais in the final mixed games of the competition.The report I have from one of the players is that PJ prevailed in his game by a reasonable margin while Carolyn and her cohorts may have failed to repeat her heroics of English conquests past. In the end, Ireland have won the Turnbull Trophy which will especially please one of our readers!! So in the words of the Meat Loaf song “two out of three ain’t bad”. Huge thanks as ever to the organisers-the ECA in the shape of Tommy Campbell, Alison Arthur and John Brown to name just three. As for the group of emerald-clad travellers (although it remains to be seen how many follow the lead of Eoin in his shamrock breeks)- many thanks to all who made the trip. We acquitted ourselves well again – and didn’t do badly at the curling either. 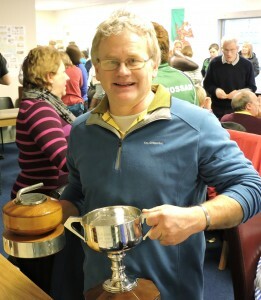 Looking forward to the Welsh hosting next year. 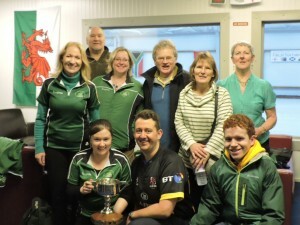 Ireland went down 32-25 against Wales in the Meikle Trophy after the completion of the Mixed matches. Johnjo and Bill skipped against Adrian Meikle and Chris Wells respectively. Right from the start Bill’s team were under pressure while JJ got off to a good start. 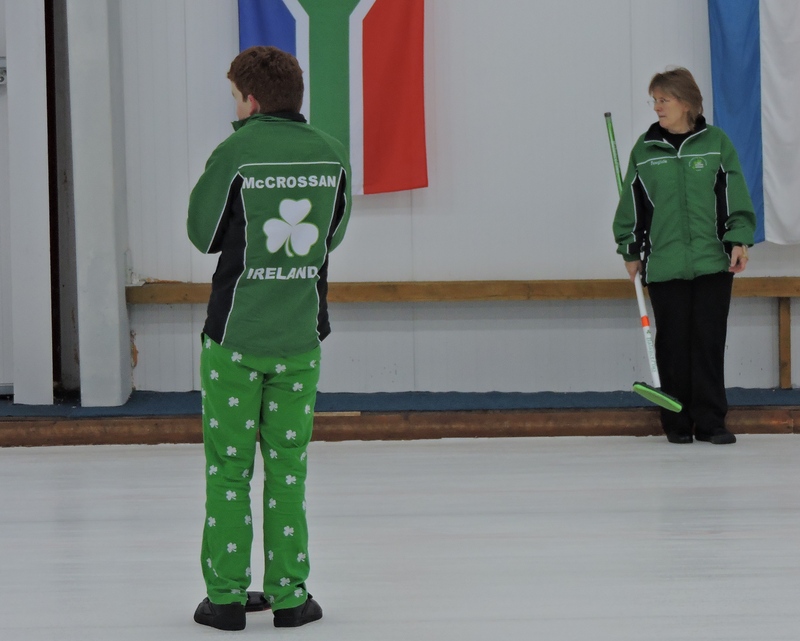 Gambling all the way to overturn the 3 shot deficit after the men’s and women’s the battling Irish boys both ended up losing to their Welsh foes – but there good games on both sheets. 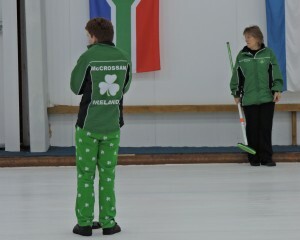 Play is underway in the final round of matches – mixed against England with Carolyn hoping to conjure up another cricket score as in the past two 4 Nations. It has been another great weekend with lots of stories that can’t be told. With international debuts for Paul Cromey, Eoin McCrossan ( most of the time), Ross Barr, Jen Ward, Frances Donald and Gillian Russell. Great times for the Irish. ‎Final day of the 4 Nations at Fentons in Kent is underway. 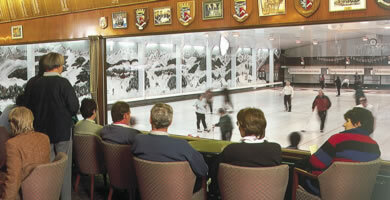 Following an evening of merry morris dancing with hearty fare and thirst quenchers the teams are at the rink for the final sessions. Ireland have already secured the Marshall Millennium trophy beating Scotland 30-24 on aggregate. Play is presently in progress for the remaining 2 mixed games against Wales for the Meikle trophy with Ireland 14-17 down after the initial games so a win is not out of reach. This afternoon’s games will be against England for the Turnbull cup and we are 14-8 up from the first games. Triple Crown is still on, Cmon Ireland! Good luck to all the curlers representing Ireland this weekend in the Four Nations at Fenton’s Rink in Kent against Wales, Scotland and hosts England. “We got a bit of a lesson at the weekend in that its never over till its over and ultimately, the reasons why we are not going to Sochi are down to our strategic failings. To have curled for so many years and made such fundamentally flawed tactical decisions at the end of games 3 and 4 was really unforgivable. Having done all the hard work to be in a comfortable winning position in both of these games, we simply threw it away. “We have no complaints about Game 1, we played very poorly and didn’t deserve to be 1 up coming home. We simply got what we deserved. Game 2 was a bit like Games 3 and 4. We played well, got our noses comfortably in front and the difference was we closed it out. “In Game 3, Bill played an amazing double to get 3 at the halfway point that really put us on the back foot. We had been at least their equal in the first half of that game but found ourselves 3 down. Then we really turned it on and curled immaculately to get 3 in front coming home. We simply couldn’t clean it up. Misses through the team left opposition stones in the house and then in attempting to win the game with a draw to the top of the house that would have left Bill nothing, we put it in the only place that leaves him any shot for a double for 3. Then the extra end we lose the left hand hack and I miss a relatively easy hit that looked as if it would plant correctly to win the game. “Game 4 was even more difficult to take. 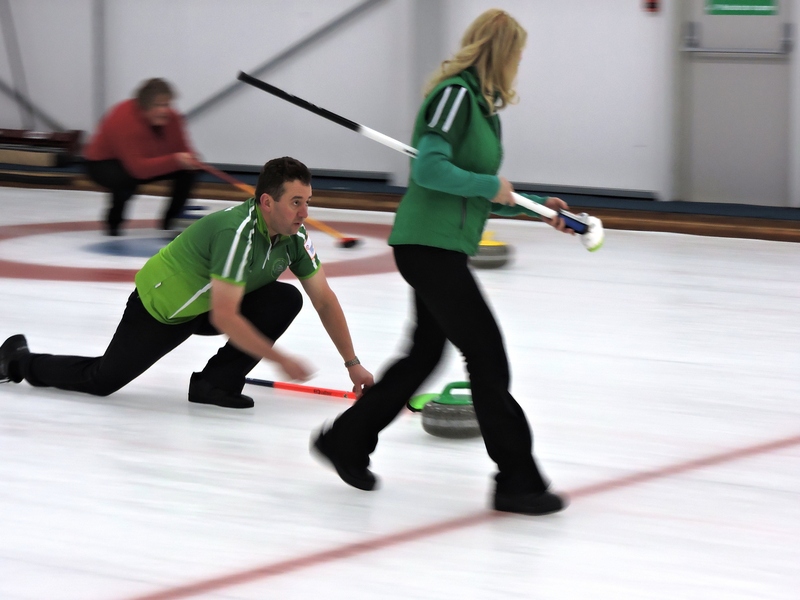 We play our best game and comfortably outcurl the opposition for 7 ends but again have last end blow out and miss crucial clean up shots during the end. Again, I attempt to freeze a back one to effectively win the game , but it lands in the only place that gives Bill a shot for a double. If we even turn the handle, Bill has to make a six foot raise and lie to make us play the last stone. Still confident on the final draw, we throw the same split time but it changes handle. 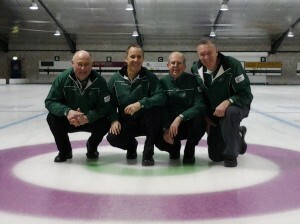 Bill G said: “We won the first game on the Friday evening, playing pretty well. Johnjo made a great double to win it. Saturday morning dawned and the skipper retired to Crossgates with what has turned out to be full-blown flu. That bumped myself up to skip and David Hume came in at lead. We played a solid game on Saturday morning but were always behind the game slightly; losing a three in the 6th cost us that one. In the third game, there were some great shots played and we were three down going into the last end but managed to get a double out to score three to go to an the extra end. In the extra, We got some guards up and got into a nice position and although Robin was lying well, we managed to squeeze in for shot. Robin had a crack at a raise but it didn’t come off and we stole to go 2-1 up. I was slightly off the boil at the start of the Sunday morning game but the rest of the boys played really well. We were probably under the hammer a little bit in this game but we didn’t give up, having been in the same situation the day before. When it came to the last end we needed to steal a two to peel. 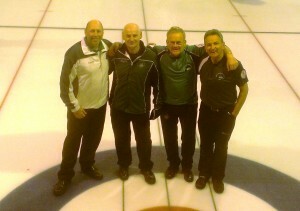 We got some stones in the house although we weren’t lying shot and unfortunately for Robin’s team they gave us the opportunity for the double which we managed to take with my last to lie 4. Robin then came up short with the draw with his last one and that was that. The boys played fantastically well, got stuck in and despite losing Johnjo, just got on with it. We are absolutely delighted to win the Championship. We have always said that the margins at this level are measured in inches or less and so it proved-particularly when the teams are as evenly matched as they were this weekend. Robin and the boys will be pretty disappointed but I’m sure they’ll come back fighting next year.